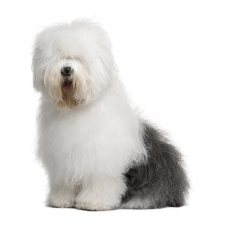 The Old English Sheepdog originated from the western counties of England somewhere in the early 19th century. The history of this dog has one of the most unclear origins of all the canines. Some breeds thought to be related to them are the Poodle, Deerhound, Scottish Bearded Collie and the Russian Owtchar, a hairy Russian breed that had been brought to Great Britain from the Baltics. The Old English Sheepdog was bred to drive cattle and sheep to the market. Owners would dock their tails to prove that they were drovers’ dogs. They became commonly nicknamed “Bob” or “Bobtail.” The OES became prominent in the United States in the 1880s and had the status of being a rich man’s dog. By the 1960s, however, the breed moved from being a status symbol to being a family pet. The Old English Sheepdog is an affectionate, happy-go-lucky, playful clown. In fact, the Old English Sheepdog behaves like a puppy until about three years of age, and an adult will retain his playful demeanor well into his golden years. These dogs are loyal, protective, intelligent, friendly, and gentle. They have a strong herding instinct and may try to herd people in a gentle way. As the Old English Sheepdog is so good-natured and kind, they make excellent children’s companions and wonderful family dogs. They are sometimes called a nanny, a term of endearment given to them because of the role they sometimes take within the family. However, they are not a very assertive watchdog, and may or may not bark when strangers come to the door. Old English Sheepdogs usually weigh between 60 to 110 pounds and stand approximately 20 to 24 inches tall. They are a big dog with a sturdy and muscular build. Their coats are coarse, and their hair is long and falls over their eyes. Colors range from gray to blue with white markings. The OES is like a large stuffed toy come to life. President Franklin Delano Roosevelt owned an Old English Sheepdog named Tiny. The Old English Sheepdog has stolen the hearts of millions on screen from the hero of Please Don’t Eat the Daisies, The Shaggy Dog, and Nurse Nana of Peter Pan.